Cable had its strongest day in nearly three weeks ending up at 1.5507. GBP/USD began a steep recovery early in Friday’s session reaching an intraday high of 1.5545. The pair is encountering resistance around that level which coincides with the 200-day moving average. A clear break above will suggest further upside and a break out of the downwards trend that’s been in place since mid-June. 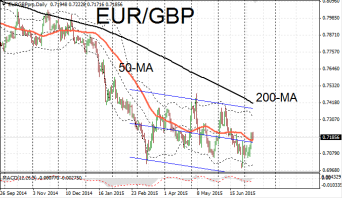 Improving trade data provided a bullish tone for sterling throughout the session on Friday. The UK’s goods trade balance narrowed unexpectedly in May. Imports fell over the month while exports remained static. This took the trade deficit down to £8B from £9.4B the previous month. The deficit has been trending downwards for the past year, and the latest data shows that it is at its narrowest since January 2014. Goods exports were largely unmoved though despite efforts to rebalance the economy away from domestic demand and towards exports. GBP/JYP mirrored moves in cable with the pair rising on very strong momentum upwards some 2% to 190.47. The pair has moved firmly back within the upwards ascending channel. Resistance lies at 190.95 and support at 189.97. 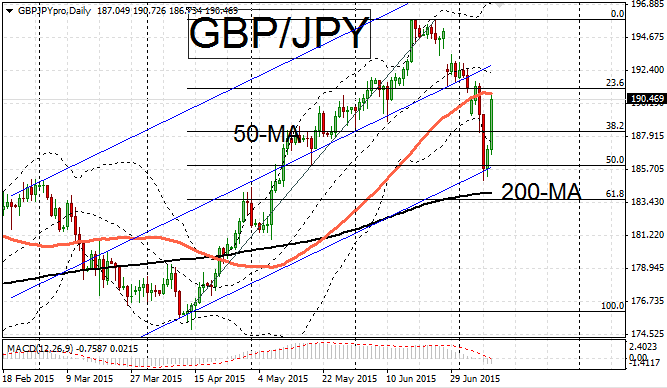 Adding to the momentum in GBP/JPY, the yen experienced a pullback after a reversal of safe haven flows. This came after a cautious recovery in Asian markets towards the tail end of the week. 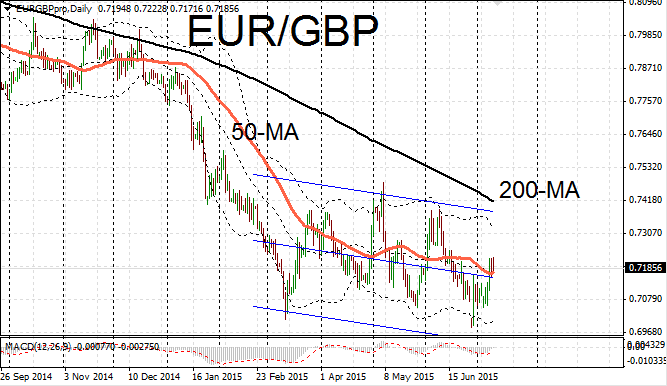 EUR/GBP pushed downwards to 0.7185 remaining within the center of a moderate downwards trend. Sterling is showing relative strength against the single currency which still has a number of risk factors weighing on it (namely Greece and QE).